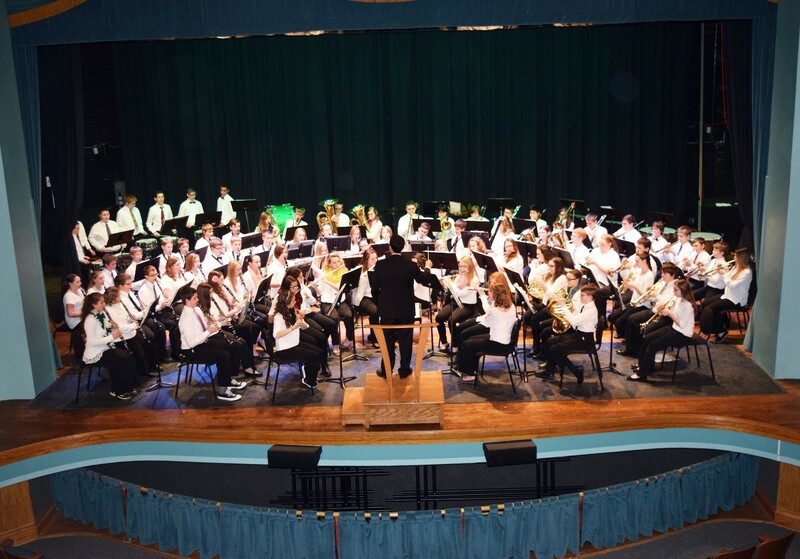 The Greenville Junior High Concert Band, under the direction of Mr. Brian McKibben, earned a Superior or 1 rating at the 2016 Ohio Music Education Association’s Middle School Large Group Adjudicated Event held at Troy High School on May 7, 2016. The Concert Band performed for a receptive audience and three O.M.E.A. Adjudicators. Each adjudicator gave the band the highest rating possible, a superior, or 1 rating. A Rating 1 is recognized by the O.M.E.A. as “an outstanding performance, with very few technical errors and exemplifying a truly musical expression”. The performance included three selection which included, “An American March” by John Edmonson; “Hound of the Baskervilles” by Mekel Rogers; and “Canadian Folk Fantasy” by Anne McGinty. Performing members of the Greenville Junior High Concert Band on May 7, 2016 are: Kendra Arnold, Andrew Bonfiglio, Courtney Bucklew, Shaylee Bush, Caleb Coppess, Ashton Crowell, Kayla Daniels, Ethan Detrick, Ryan Dull, Macee Dunfee, Nathan Feurer, Dennis Forte, Chloe Freeman, Josh Galloway, Sophie Gettinger, Haley Gilpin, Destiny Grillot, Reed Hanes, Reese Hartle, Adeline Haupt, Tristan Heaton, Makayla Hess, Taylor Hines, Ryan Howard, Michael Huston, Katie Jay, Shelby Johns, Matt Karns, Alex Kiser, Emma Klosterman, Madison Klosterman, Kelli Kretschmar, Felicity Lance, Aubrey Landis, Ian Laux, Brianna Leffel, Branson Leigeber, Jaycee Lewis, Caiden Lutz, Caleb Maloon, Faith Mansfield, Katlin Marshall, Aaron Matthew, Sarah McDaniel, Tristan McDaniel, Elisha Meeks, Lyndee Miltenberger, Jessica Mortensen, Landon Muhlenkamp, Ryo Murakami, Tomoya Narita, Samantha Newberry, Nicole Osborne, Austin Price, Jan-ice Price, Kristin Rieman, Kiana Satterwhite, Taylor Schmidt, Wes Shaffer, Isabel Shaw, Logan Shields, Dawson Shirley, Brayden Skinner, Brianna Smedley, Emily Snyder, Kirsten St. Myers, Alex Strait, Ashley Strosnider, Aaron Suter, Allie Tanner, Ethan Tutwiler, Kameran Wallace, Jordan Warner, Grace Washington, Ethan Watkins, Jacob Watson, Nathan Wintrow, Sierra Wogerman, and Mason Wykes. Members of the Concert Band who were unable to perform are: Gabe Heilbrunn, Gloria Harrison, Isabel Rammel, and Kole Maples.